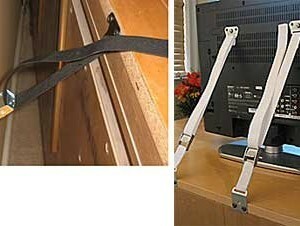 The Pro-Strap Anti-Tip Furniture/Flat Screen TV Safety Strap protects children from furniture and TV tip-overs. These top quality straps were designed for use by professional childproofers 5 Myths About Furniture Tip-Over Injuries from Childproofingexperts.com Myth #1: The dresser is so heavy, it will not tip over. When a child opens the drawers and climbs on them, even a heavy dresser or other type of furniture can fall on a child. When the drawers are opened, the center of gravity changes and the furniture could tip over, with or without someone climbing. Myth #2: We do not need to anchor the dresser in our bedroom because our children do not play in our room. Tip-over injuries can happen very quickly. Children may wander into a room when you do not expect it. Anchor the furniture in master bedrooms and other rooms, not just the nursery or play room. Myth #3: We latched the drawers so the dresser is now safe. 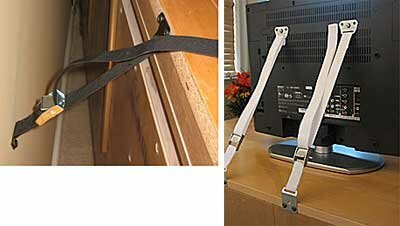 Cabinet latches ARE NOT designed to replace furniture anchors. A three-year-old might be able to defeat many cabinet latches but is still at risk for a serious tip-over injury if he or she climbs on a dresser. Myth #4: Older children know not to climb. Children do not think about a dresser or a bookcase being something that could harm them. They climb to reach something they want on the top of the furniture. Often, drawers are used like a ladder so the child can reach an item that is too high for them. Even if you have explained that climbing is dangerous to your toddler or pre-schooler, a parent should not trust that a curious child will remember their safety lesson. Myth #5: We purchased a sturdy dresser and a bookcase from a great furniture store. ALL TYPES of furniture pose a hazard, including discounted furniture and high-quality furniture, tall bookcases and short bookcases, short chests with drawers, tall dressers, armoires, furniture with shelves and/or doors and more. Anchor furniture, and consider pieces with drawers to be extra risky.